Note: Some videos may not be up-to-date, with the following screenshot as the latest reference. = 2.2 = * New: New API rebuilds. * Tweak: Removed ajax method of all modules pop-window in admin panel, reduce High CPU Usage of WordPress. * OPTIMIZE: Updated all default templates of page builder. = 2.1 = * OPTIMIZE: Updated all default templates of page builder. * OPTIMIZE: Optimized the page builder’s experience. = 2.0 = * NEW: Enable the Drag & Drop visual page builder. Very easy to create pages, and quickly choose and edit from our premade 10+ templates. (fast and easy switching simply by clicking a mouse). Provided by Uix Page Builder from WordPress.org. 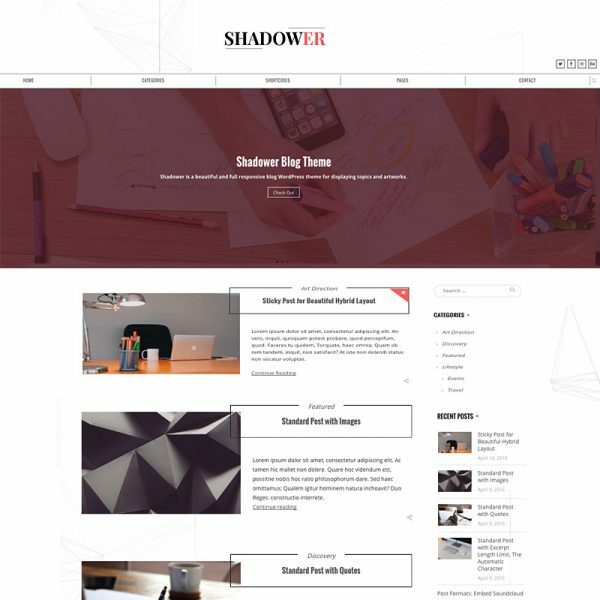 At the same time, keep the original home page templates in the theme directory. 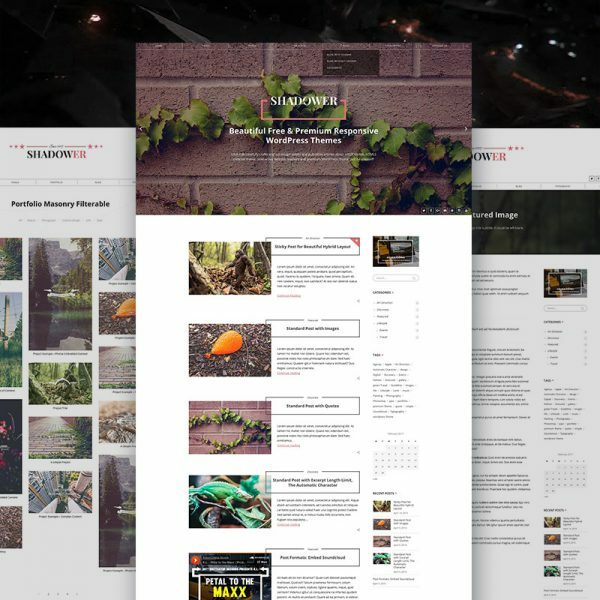 * NEW: Added 6 unique One Page styles. 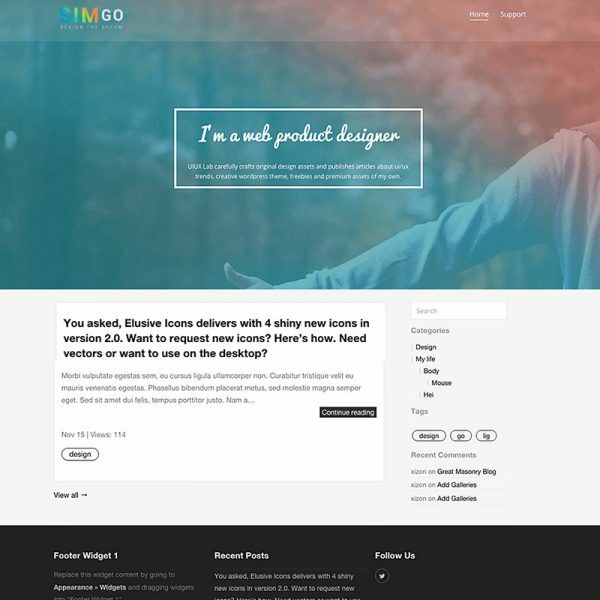 * TWEAK: All kinds of styles Home Page full support Page Builder. * OPTIMIZE: Optimize the scripts hook on required admin pages. = 1.7 = * NEW: Added instagram footer widget. Simply go to Appearance » Widgets in your WordPress admin area. Next drag & drop the “Instagram Feed” widget to the “Full-width Footer Area”. * NEW: The theme has been translated into German. It is available in Deutsch. * FIX: Fixed the text-domain incorrectly causing errors that could not be displayed correctly in other languages. = 1.6 = * NEW: Added “ShadowerPro_Uix_Custom_Metaboxes” class in order to add custom metaboxes to custom pages. (More fast, simple and compatible). * FIX: Fixed a bug that the search results shows a post’s category above the title which is just a white space in the line. * OPTIMIZE: Optimize the appearance of custom metaboxes. * OPTIMIZE: Enabling TinyMCE to better handle languages written from right to left. – FIX: Resolve an error of primary navigation on the mobile that are not displayed using the Font Awesome icons. – FIX: Resolve an error of admin-bar and primary navigation display when the front-end page scrolls. – FIX: Resolve the menu display issue. The menu needs to have a fallback for when no menu is selected. – FIX: Optimized navigation user experience, the theme navigation bar when add a long menu to it wrap. – FIX: Resolve the mega menu bugs in a Right-To-Left (RTL) direction. – FIX: Fixed an error that does not display the copyright information when the primary navigation was not selected. – NEW: Customized copyright information supports dynamic tag replacement. – TWEAK: Updated Uix plugins packages and enhanced compatibility. – OPTIMIZE: Optimized HTML styles for comments list. – OPTIMIZE: Optimized categories styles for posts list. – OPTIMIZE: Optimized template for displaying Author bios. – OPTIMIZE: Use “Modernizr.cssanimations” instead of “jQuery.browser” for main script because the theme shouldn’t really rely on UA testing this way either. – OPTIMIZE: Optimize the theme dependency and notification of PHP version. Resolve those issues when handle this on theme activation, and display the notice only in the wp admin. – REMOVED: Remove the ‘is_pjax()’ from the core class. – REMOVED: Remove ‘source’ in tgm activation configs for theme recommended plugins (Still retain the plug-in package in theme “plugins” folder). Plugins that are available in the wp.org repository should only specify the slug, the version numbers should be the minimum versions supported by your theme. This would help gain more trust for users installing those plugins as well as it would remove the label “External Source” from the activation page. – NEW: Added 6 social media icons: Stack Overflow, WordPress, Codepen, Amazon, 500px, Vk. – Fix: Removed duplicate HTML tags for single post page. – Fix: The horizontal scroll issue was caused by adjustment of display’s resolution. – Fix: Styles of footer menu issue. – NEW: Added Unlimited Color Options, keep the “Predefined Color Scheme” simultaneously. – OPTIMIZE: Optimized typography for front-end display. – TWEAK: Upgraded WordPress style of sticky post using SVG instead of PNG to speed up your website. – Fix: Styles on content hyperlinks were lost. – NEW: Allows you to customize the scroll animations for post list. ( If this option turned on, the post list will use easy scroll animations for web and mobile browsers. ) – Fixed: Resolved thumbnails bug that may appear on the gallery post type. – NEW: Allows you to customize the Loader Style. – OPTIMIZE: Optimized slider readability for other style of the home pages on mobile. – OPTIMIZE: Minimized and compressed assets for core front-end files ( style.min.css and script.min.js ), which also reduces the load on your server. Keep the original file simultaneously.